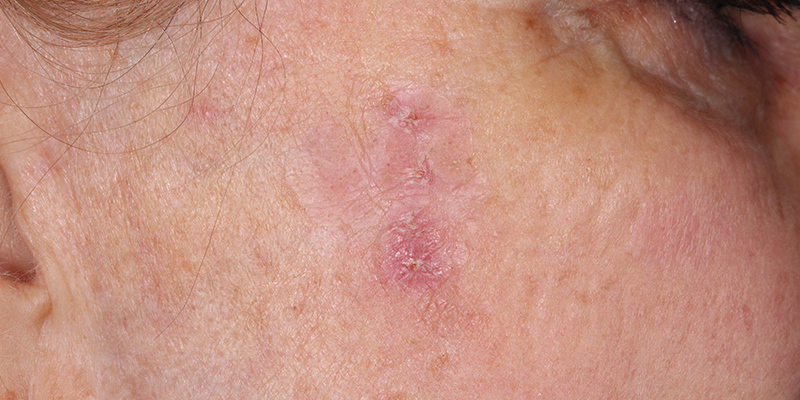 Actinic Keratosis is a complex term describing skin lesions. Most typically AKs will appear as a rough or scaly patch; however, AKs do not have to be visibly seen to exist, as they are commonly known for disappearing and reappearing over time, seeming like a recurring rash. It is important to note that these lesions are not automatically cancerous, but they should be examined by a dermatologist right away. Actinic Keratosis is a warning sign that cancer might be the next step in your skin's development. For most people, Actinic Keratosis appears in circular patches that feel crusty to the touch. You may even notice skin cells breaking away from the site, making it appear as though you have dry skin. If these areas are ignored, small, bumpy lesions may turn into visible horns that grow out of your skin. Generally, a more unusual growth has a better chance of being cancerous. Actinic Keratosis is known for its unusual growth and developmental habits. A patient can have this ailment without ever seeing a visible growth. For example, a pesky itch on your skin could be an indicator of AK. If this happens to you, take a moment to really feel this skin section. Use your touch as a way to "see" the growth. AK growths will feel rough and scaly. If you press on them, they might be painful too. Additional symptoms include, burning, itching, and consistently dry skin. If you suspect that you have AK, schedule an appointment with a dermatologist right away. A dermatologist will examine the skin closely to determine whether there is a presence of AK. If necessary, a biopsy may be performed for further testing. Since Actinic Keratosis is not cancerous itself, there are several treatment options available to help heal the skin. Keep in mind that if you have a history of developing Actinic Keratosis, you will want to be very diligent with your regular dermatological exams, so that you do not put your self at further risk of developing a skin cancer. Actinic Keratosis is commonly the result of skin damage from over exposure to the sun. To prevent skin damage, use sun safety practices, such as wearing sunblock every day, covering up with a hat or umbrella when you will be in direct sunlight, and avoiding peak hours in the daylight. These hours range from about 10:00 am to about 4:00 pm, depending on your geographical location and daylight saving time. Once you've been diagnosed with AK, growths can occur at almost any time. It's important to continue with your annual or biannual skin evaluations, so that your physician can make recommendations before there is a chance of skin cancer developing. Maintain your monthly at-home skin checks, and listen to any medical advice your physician provides. Do you have scaly patches?